A bumper crop of family films has arrived for the Easter holidays. From animated monster tales to underdog sports movies, Sarah Ward picks the good and the bad. It’s that time, again. School’s out for a few weeks, eager young feet are headed towards cinemas and plenty of viewing options await. 2019’s Easter crop is particularly plentiful, spanning everything from animated takes on man-versus-monster tales to Australian-made sports comedies. Plus goofy superhero shenanigans, beloved flying elephants and body-swap antics as well. 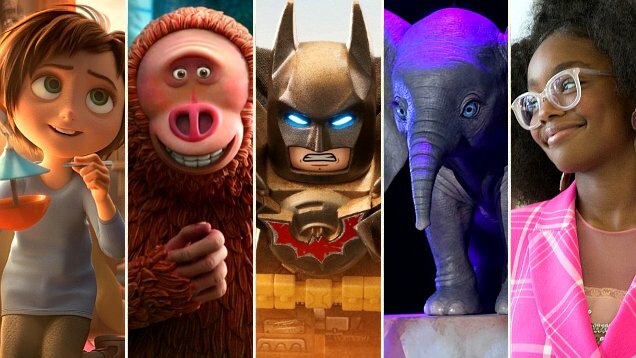 If you’re wondering which of this year’s eight kid-friendly Easter releases are worth your time and money, here’s our viewing guide — for the young and the young-at-heart. After the delights of Coraline, Paranorman and Kubo and the Two Strings, the animation studio Laika maintain their impressive streak with their fifth all-ages release. In Missing Link, Hugh Jackman voices a monster hunter, Zach Galifianakis is a sasquatch who wants to be found and loved, and Emma Thompson lends her talents to basically the yeti version of Tilda Swinton. There’s plenty that’s familiar about the film’s themes, but this energetic, expressive movie is never less than charming — with western parodies, odd-couple comedy and rich voice work helping immensely. Of course, as always in Laika’s work, the eye-catching stop-motion is the undoubted star of the show. Produced by The Rock, who appears in a cameo, Fighting with My Family takes its true tale from the world of wrestling, but this underdog comedy isn’t just preaching to the converted. Underdog sports movies strike a chord for a reason — and whether you’re familiar with WWE star Paige or a newcomer to the ring, prepare to be entertained. Much of the movie’s success comes down to its performances, with Florence Pugh a knockout as the star of the show, and Nick Frost, Lena Headey and Jack Lowden all ably fleshing out the rest of her wrestling-obsessed British family. That said, although writer/director Stephen Merchant might seem an unlikely choice, he blends the movie’s energetic laughs and easy-to-foresee dramas seamlessly. On paper, Tim Burton and Disney’s latest live-action reimagining of one of its popular properties seems like a match made in heaven — or at least the great heights reached by a tiny flying elephant. And when 2019’s version of Dumbo focuses on its titular creature, it soars. When it lets Burton tell another outcast tale, which the filmmaker has long been drawn to, this nearly eight-decades-later remake hits the mark emotionally as well. When Dumbo spends time with its human characters, it is far, far less magical, with Colin Farrell and Eva Green playing thinly written parts and Michael Keaton rehashing his current villainous guise. Thankfully, their CGI counterpart always steals the show. This body-swap comedy came about just as anyone would expect, with Marsai Martin watching Big then conjuring up a reverse take on the premise. Martin isn’t just the film’s driving force off-screen, however. The 14-year-old Black-ish star is the standout on-screen as well. Playing the middle-school version of high-flying tech whiz Jordan Sanders, Martin brings spark and vibrancy to a script that’s extremely predictable, but still throws up a handful of laugh. Regina Hall and Issa Rae are also well-deployed as the bullying adult Jordan who gets cut down to size and her long-suffering assistant. Superheroes are child’s play in Shazam! – literally. The latest DC Extended Universe installment understands that caped crusaders are all a bit silly. Never as ridiculous as Aquaman or as engaging as Wonder Woman, Shazam! is also never more than standard; however when it works, it works. Zachary Levi has a blast as the beefed-up superhero version of foster kid Billy Batson (Asher Angel), and the kid-centric testing-your-powers montages are fun, but can’t completely counteract a bland villain and an over-reliance upon formula. There’s such a fantastic message at the heart of The Lego Movie 2: The Second Part, the brick-based film pondering the gendering of toys and of playtime in general. And there’s the same joke-a-second vibe that made the film’s smash-hit predecessor one of the great all-ages comedies, too. There’s also something missing this time around, as Emmet Brickowski (voiced by Chris Pratt) tries to save his pals from a new threat (voiced by Tiffany Haddish). It feels like he’s going through the motions. Indeed, everything isn’t quite so awesome; however the film does offer another killer song over its closing credits. A child-oriented journey of discovery, Wonder Park can’t find the balance between tugging hard on the heartstrings and serving up boisterous fun. That’s the film’s struggle from start to finish. While the movie sends pint-sized tyke June Bailey (voiced by Brianna Denski) off to an imaginative realm, Alice in Wonderland or Spirited Away this definitely isn’t. After spending her childhood dreaming up an amusement park with her mother (Jennifer Garner), illness strikes, and June is left playing by herself while her mum seeks treatment. Sent off to maths camp, she instead detours into a real-life version of her fantasy space, but it’s in peril. Colourful animation and celebrity voices can’t save this, even for extremely young viewers. Early in Back of the Net, a couple of adolescent Australian girls ask American import Cory (Sofia Wylie) if she knows Ryan Gosling or Jennifer Lawrence. It hardly seems like something today’s tweens would ask, and that’s part of Back of the Net’s problem. Trying hard to be bright, bouncy and upbeat, it instead feels forced — and dated pop culture references are just the beginning. Broadly taking its cues from Bend It Like Beckham, the film sees science-obsessed Cory headed for a semester at sea but ending up at a soccer camp. There, she’s the outsider trying to fit in, win the cute boy’s heart, overcome the resident queen bee and emerge victorious on the field. The movie proves as blandly well-worn as it sounds.